Over the years Karvik has lost its bond with the sea that it borders. The waterfront, which was once what the city relied on, is now nothing more than a city limit. 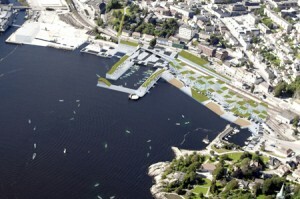 Kjellgren Kaminsky Architects came up with a design that brings back life to this harbor and makes it the heart of the city. The design uses sightlines and walkways to create connection rather than just introducing bridges.